Tower Hamlets put in a solid performance on Friday evening, as clinical finishing and solid defending saw them run out 5-0 winners. Relegation is still not totally dispelled with yet, but Hamlet’s managed to surprise title contenders Stansted recently and the Tons were left shell-shocked at Mile End Stadium. Manager Ajibola Ashnike placed himself on the starting line-up, marshalled his defence into a solid unit but opened the account at the other end, with his 9th minute header from a corner setting his side on their way. Two minutes later and Hamlets were two goals to the good. Wale Odedoyin breezed past Toby Smith the Tons ‘keeper, then dragged the ball back at the by-line into the path of Montel Williams who swept the ball home. Clapton were able to test Charles Casey when Ali Al-Nashi was able to rifle a shot off. The Hamlets shot stopper also had to pull out all the stops to keep out a Hadi Habboushi free kick, which was curling in until Casey was able to get his fingertips to it, pushing the ball onto the bar. That suggested that the Tons were not giving up just yet. But the hosts were clinical with their chances; after a quiet spell they then carved out another opportunity in the 31st minute and went further ahead. A ball was played to Odedoyin, who then launched a powerful run that took him past Tons defence and ‘keeper, before finishing the job off. Even now the Tons rallied with Andy Greenslade going close for the Tons, but standout defending from Simon Bamidele, Tola Odedoyin and Ashnike kept the Tons forwards quiet. An amazing shot from Ibrahim Adeyemo, who was standing in his own half, looked like it was darting into Clapton’s goal, forcing Smith to dart back and get a hand to it. The Tons simply could not concede again and hope to get back into it. They needed a goal themselves before the break if they wanted to find a way back as it was. Greenslade nearly provided it when his shot crashed into the side-netting having left the Hamlet ‘keeper well beaten at his left hand post. Clapton had an early penalty appeal in the second half turned down by the referee. In the 55th minute the Tons were handed another bad deal when they went even further behind. A corner was headed home by Luke With to place Tower Hamlets in an unassailable lead. Odedoyin had an effort hit the bar, then Hamlets had further fortune as Jacob Kromann’s run into the box ended with him going down in the box; again the referee waved play on and Clapton were denied another penalty. But even now the Tons still tested the Hamlets backline. Freddy Sacramento had a free kick tipped away by Casey and they continued looking to get at least one goal. But Tower Hamlets on this night were solid at the back, which also played a major part in their victory. 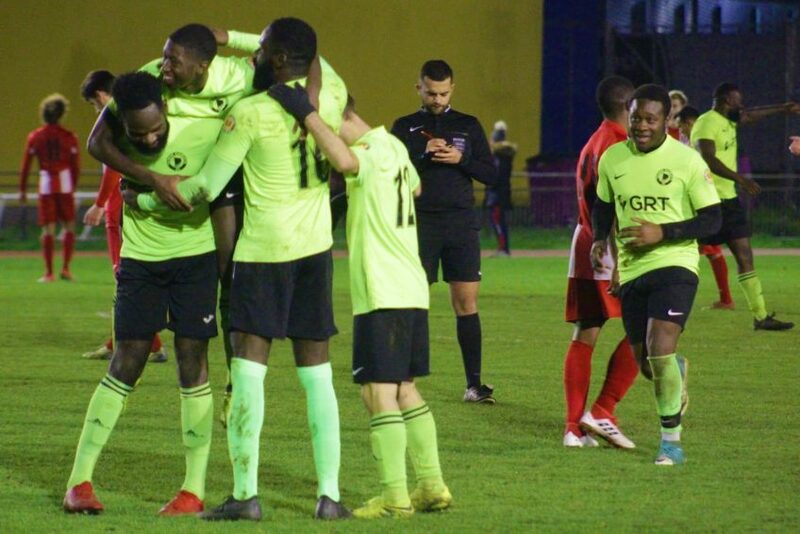 Hamlets set their stall with two quick first half goals and they closed their account in the 84th minute when Odedoyin latched onto a wayward back pass, rounded the ‘keeper and completing a fine Friday evening East End derby over Clapton. Ashnike’s men are doing their level best to move away from the relegation battle as we move towards the end of the year. Jon Fowell meanwhile took his troops back to Newham having slipped down to 14th. Tower Hamlets: Charles Casey, Simon Bamidele, Amon Walter-Owen, Ibrahim Adeyemo (Ijhal Currie Wilson 82’), Tola Odedoyin, Ajibola Ashnike (Capt), Montel Williams, Flavio Jumo, Luke With, Wale Odedoyin, Dominic Weston (Simone Di Giglia 21’). Scorers – Ajibola Ashnike (9’), Montel Williams (11’), Wale Odedoyin (31’, 84’), Luke With (55’). Clapton: Toby Smith, Dominic Shephard (Taylor Ricketts-Williams 78’), Giovanni Palmer (Lanre Virgo 67’), Freddy Sacramento, Eusebio Da Silva, Jason Ajoodha, Hadi Habboushi, Andy Greenslade, Jacob Kromann, Ali Al-Nashi, Tayo Awoderu (Jermain Findlata 67’).